Cutting volvo 240 factory springs. 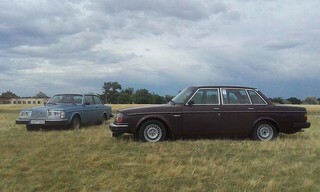 There are probably 20 threads on lowering a volvo 240, so im sorry bringing it up again. 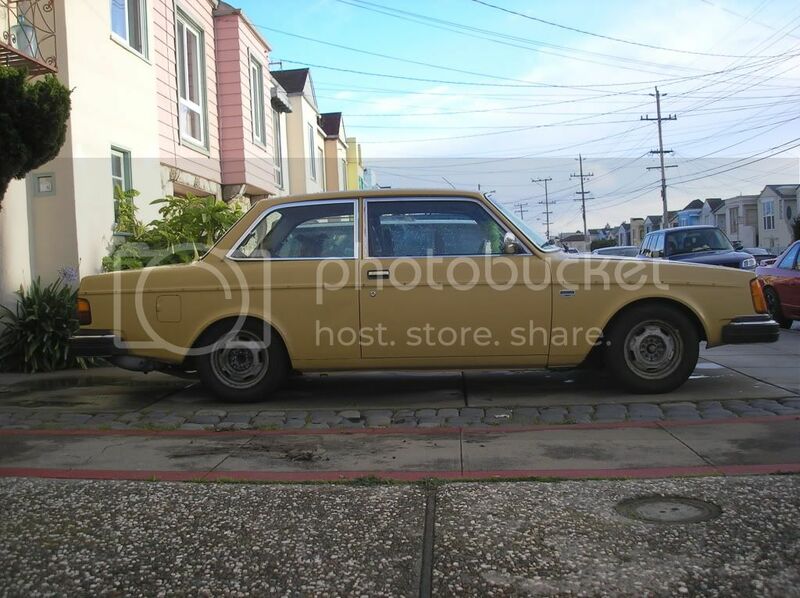 I have a 1982 volvo 240 coupe, and i bought all four springs from a salvage yard for $40 which was a steal of a deal! Now, i am just wanting to cut them, but i dont know exactly how many coils to cut. Like i am looking to lower my car, so that i have an inche from the fender to the tire, but not completely slam it. If you can, please show me how much to cut with a picture to see how it looks. I only want to see the sedans, or coupes. No wagons please. Cut 3 coils all around and call it a day. So you are putting a 242 in the weeds with what shocks? Do you have an adjustable panhard bar and torque rods to center the rear and fix the pinion angle? 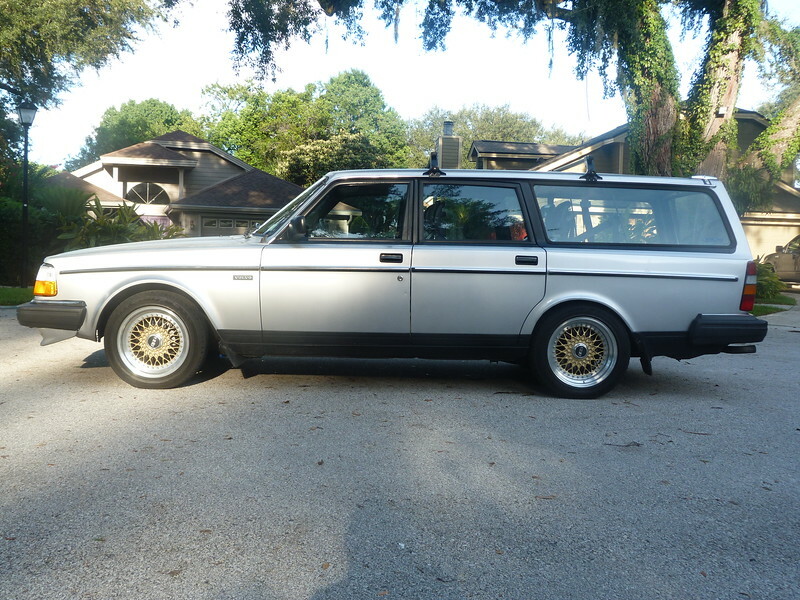 Just saying because it could be a bumpy ride on Volvo shocks. It's going to bounce like a basketball with 3 turns cut. 2.5 turns front & 1.75 turns rear. Crazychopstick's spring cutting guide is HERE. Welcome to Tbricks & enjoy your stay. If you cut so much out of your springs that you need all that hardware to get the axle lined up again then you've probably cut too much and should have bought lowering springs in the first place. start by cutting 2 coils in the front and 1 in the rear and see where that puts you since you can always cut more later. 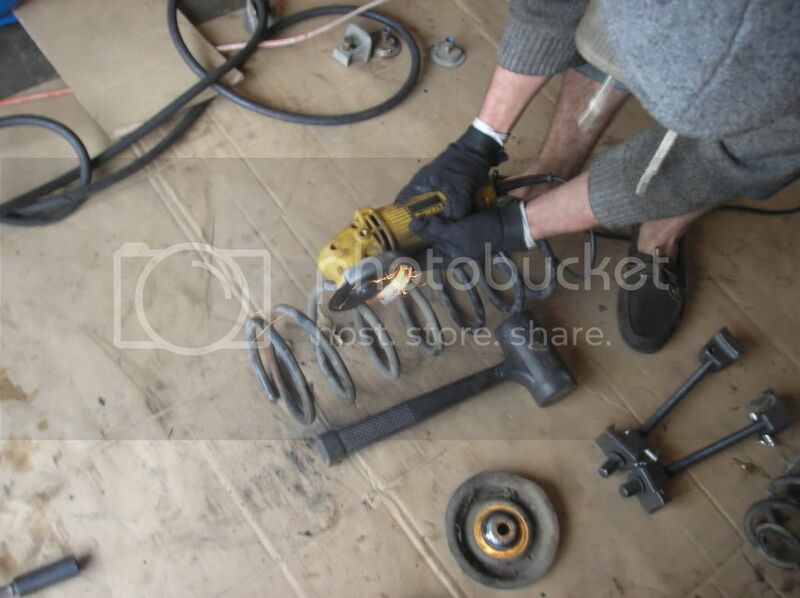 either way you will need to replace the shocks shortly after any lowering. "coilovers" are the easiest way to get the best of both worlds. That's not true though. I'm not the only one here who has cut springs without sacrificing ride quality. Sure it makes the car stiffer but isn't that the point??? cut one coil and see if you like it. if not cut another. "I cut it 3x and it's Still too short"
If you use a dressmaker's cloth measuring tape wound along the spring, you can get the lengths Exactly the same. Maybe it don't make no damn difference, but I liked the idea. Every 240 is a little different and since you aren't wanting your car really low, you should start conservatively and cut more if it's not low enough for you. Stock ride height is affected by a lot of things. A/C and power steering are heavy. If you don't have those your car MAY sit higher. Condition and amount of abuse your 240 has seen over the last 32 years play a factor as well as current struts/shocks/bushings and their condition. 2.25 coils in the front and 1.5 coils in the rear is really similar to the height of IPD's "Lowering Sport Springs". What does the panhard bar and torque rods have to do with the shocks and how it rides?!? At the level we are talking here, absolutely NOTHING. Sure, they will re-center the axle and adjust the proper pinion angle back, but they are not a necessity right away by any means. Usually you get a slight acceleration vibration between 30-35mph when lowering 2-3F/1.5-2.5R that is very livable until you can afford to have the pinion angle corrected with IPD or similar adjustable torque rods. If the Volvo shocks were previously in okay shape, why would lowering the car make them all of a sudden bouncy? It won't. Generally they perform ever so slightly better because you have moved them out of their worn in position into a new position with less wear. no i dont have any of the above. haha i honestly was just going to cut the coils for now, then upgrade the panhard bar, torque rods, and get better shocks. probably bilstein. Get better struts and shocks first. Then upgrade your panhard bar and torque rods. Bilstein HD's are the best (imo) off the shelf choice. Since Bilstein HD's are expensive, you should consider if you are going to want to go lower in the future with shortened coil-overs. You don't want to have to buy Bilstein HD's twice. 3 coils is not what makes it bounce. Lack of travel and strut/shock is what makes it bounce. You can work a decent compromise even up to 4 coils if you know what brands to use and get creative with bump stops. Badger was cut 5 for a bit and I still had a little travel left on stock length struts. Badger was light though, so it needed cut more to get it lower. What is the difference between cut coils and lowering springs? Lowering springs magically correct your suspension and driveline geometry somehow? No, they are nearly identical except a slightly different spring rate and the coils sit a little nicer in the seats with the dead coil being there. That's it. Cutting 1 coil will do almost nothing at all. The first coil is a "dead coil" so the spring sits nicely in a spring seat. If you cut that off you basically lower the car the thickness of the coil. Absolutely not true. You can cut 2 coils and still regain your lost travel so it will still ride very near stock (except for the slight spring rate increase from cutting the spring). What good are coil-overs if you have no suspension travel? You can only go so low before the strut bottoms out. Coil-overs don't magically give you shorter struts. Most go beyond the point of being able to recover the lost travel because it "looks better" to be lower. There is only so much travel you can fudge to try to get ride quality back. At some point you are going to have to compromise or build shortened coil-overs. This is a disguised clue as to what most people here don't understand. You must trim your bump stops to regain the travel you are losing by lowering the car. THIS is how you lower your car and have it still ride good. Again with the 1 coil. Nice idea, but it's not all that important with our tired old stock springs. I actually trim them unevenly on purpose to get the car to sit level again and maybe if I'm feeling overly energetic, adjust the corner weighting slightly. I just have one question, can original 300k+ dampers dampen 1,5 coils cut from the front? I want to pass MOT check, where they check every damper of the car. But I also want to cut off the rusty 1,5 coils off the top of the springs and flip them upside down. I know it wont become significantly stiffer, and its still not a diesel spring. Car felt decently before i tore it apart. My bet is it will pass, maybe I will lower the tire pressure just a little bit. Opinions? If you cut the springs 1 coil 2 coils or 3 you will lower the car but the spring rate will be the same and you could end up hitting the bump stops. Stiffer springs will give you a firmer ride. I used IPD 2" lower springs with great results. There are other springs out there that do the same. I have a hard time believing those worn out shocks even dampen the stock springs! No. By removing coils you increase the spring rate slightly. That's why cutting a couple coils works well. If you don't remove too much suspension travel, then it's a good way to lower something. Moderation is key. I think that's a good plan, depending on how low you want to go. I really can't perceive it being that much stiffer, if at all. So the shocks will be the same as they are now, although they do sound pretty damn worn out. Wouldn't be a bad idea to replace them, because they're pretty cheap and will make a dramatic improvement to the feel of the car. I kind of wish I had only done 3/4 of one coil in the rear, to keep a little bit more rake. 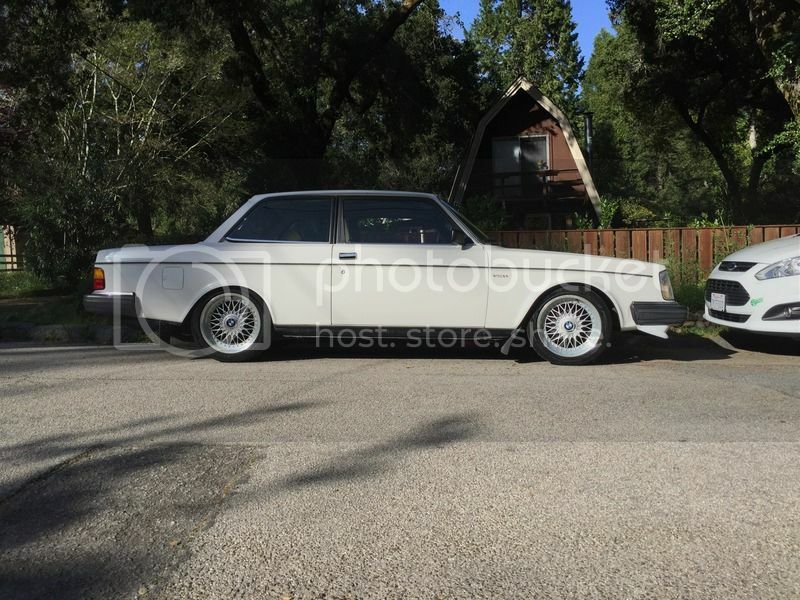 I don't want to go lower in the front, but I like 240s to have a bit more of a nose-down angle to them. I might just go ahead and cut another 1/4 coil out of the front, because aesthetics. I did 2.5 in front(not purposely, just wanted to do 2) and 1.75 in the rear. It actually turned out better then I thought. I also have 15 inch steel wheels from a 740.
the more you cut the springs the higher the spring rate gets. you gonna wreck if you drive with bad shocks. Everything Tuff240 said + 1000. I did 1.5 coils on the driver side/ 1.75 coils on the passenger side and 1 coil on both rears on my 245. Car sits dead level and rides fine. Fortunately there are a few companies who rebuild non rebuildable shocks (most of the time an oil change brings them back to life) for a pretty cheap price. This is the plan if they feel ****ty. Main thing is to keep the car comfy, boaty, but drop the car a little bit to forget that offroad setup and get a nice nose down look. Lol, if the driver is dumb enough, he can wreck even the best racecar in the world. If it feels ****ty, I wont trust it and create dangerous situations.. I still love your car... And I'm jelly at those wheels, they make the car look awesome even if its not that low. Last edited by petiww; 10-14-2016 at 04:40 PM..
Diff in weight from the drivers to passenger side. Add the driver, power steering/ A/C comp and battery all on the DS will need a bit more spring to sit level. My side to side in the front on un cut springs was about 3/4" to 1" diff , now both sides are spot on 26" from the center of the fender lip to the ground. Tuff240 apparently has this dialed in . Here is how she sits now.